We evacuated to the basement last night due to tornado warnings and are expecting more violent storms tonight, so dinner had to be something quick. 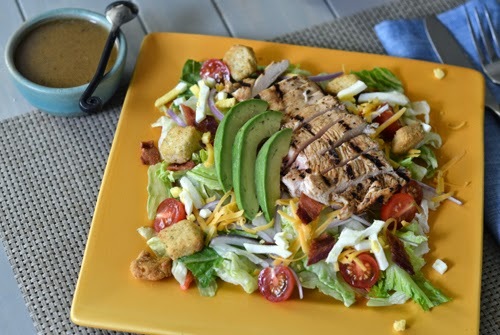 I thought a sort of grilled chicken Cobb salad would do the trick. 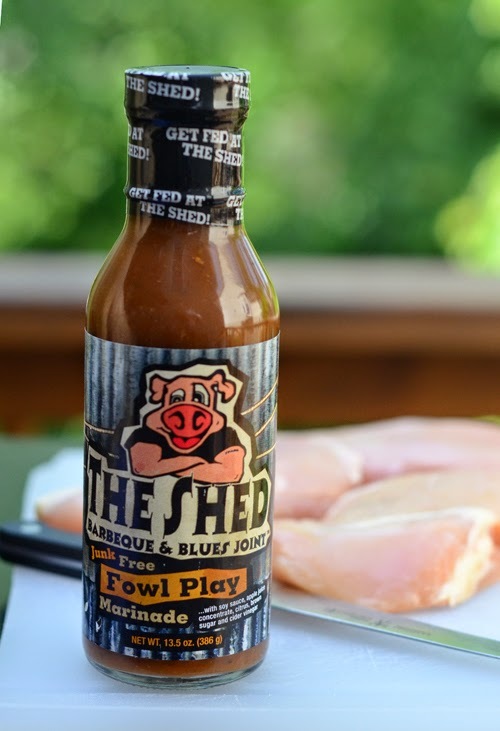 I was going to whip up a marinade but at the store I saw Fowl Play chicken marinade from our friends at The Shed Barbecue and Blues Joint. I have tried a few of there sauces and marinades but I hadn't tried that one yet so I picked up a bottle. To speed things up, I butterflied the chicken breasts so they would marinate and cook quickly, before the petulant storms returned. 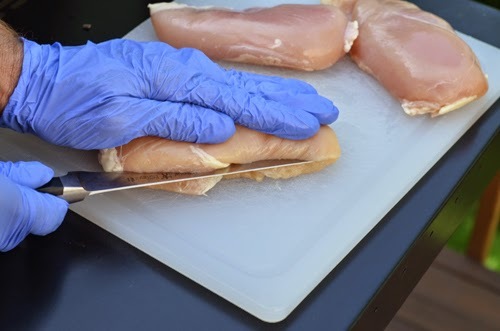 To do this, I picked out a pack of breasts at the store that was still partially frozen so it would be easier to slice. I press down with my free hand and simply, but very carefully, slice horizontally through it almost all of the way through, but stopping about 1/2 inch from the end. Then just press it open like a book. 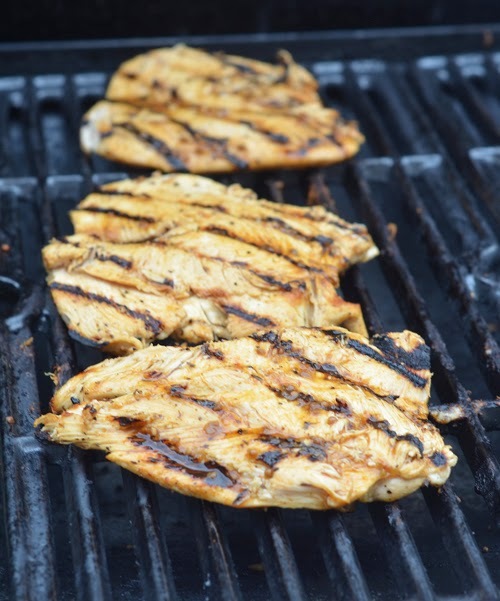 I put the butterflied breasts into a gallon zip top bag with some of the Fowl Play marinade. I tasted it and it has a good bit of acidity in there with lemon, lime, and vinegar. I thought that if most vinaigrettes also make good marinades, then maybe this marinade would make a good vinaigrette. It did. Put the Fowl Play, Dijon, and salt into a medium mixing bowl. Slowly stream in the oil while whisking rapidly until well combined. Taste and adjust seasoning with additional salt and some pepper to taste, if desired. The skies were growing dark so I fired up the Char-Broil Gourmet TRU-Infrared gas grill since I can get it up to temp, cook, and then cooled back down way faster than my kamado grills. 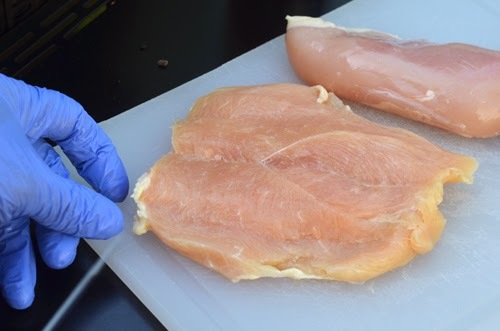 I grilled the breasts over medium high heat (450°F) until they reached an internal temp of 160°F, about 3-4 minutes per side. 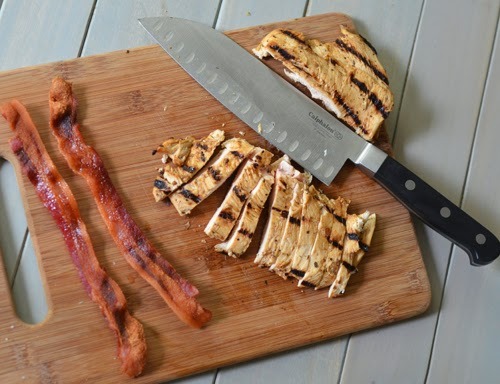 I let them rest for a few minutes while I assembled the rest of the salad ingredients and then sliced the breasts. Then it was just a matter of throwing it all together. 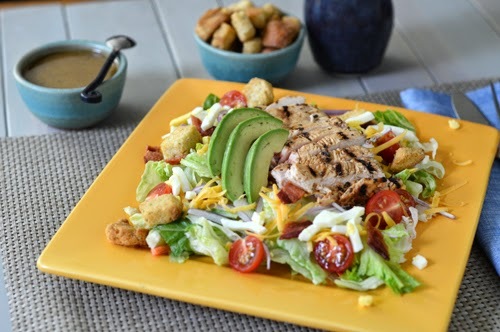 ...and of course, the Fowl Play Vinaigrette. For a quickie this was a great dinner. Alexis said I could make this several times a week and she'd be happy. If I'm going to make salad, I make it so it won't leave me hungry an hour later.